The tsquery language is used to specify statements for retrieving time-series data from the Cloudera Manager time-series datastore. Retrieve time series for all metrics for all DataNodes. Retrieve cpu_user_rate metric time series for all DataNodes. Retrieve the jvm_heap_used_mb metric time series divided by 1024 and the jvm_heap_committed metric time series divided by 1024 for all roles running on the host named "my host". select jvm_heap_used_mb/1024, jvm_heap_committed_mb/1024 where category=ROLE and hostname="my host"
Retrieve the jvm_total_threads and jvm_blocked_threads metric time series for all entities for which Cloudera Manager collects these two metrics. The statement select * is invalid. Tokens are case insensitive. For example, Select, select, and SeLeCt are all equivalent to SELECT. The metric expression can be replaced with an asterisk (*), as shown in example 1. In that case, all metrics that are applicable for selected entities, such as DATANODE in example 1, are returned. The predicate can be omitted, as shown in example 4. In such cases, time series for all entities for which the metrics are appropriate are returned. For this query you would see the jvm_new_threads metric for NameNodes, DataNodes, TaskTrackers, and so on. A metric expression generates the time series. It is a comma-delimited list of one or more metric expression statements. A metric expression statement is the name of a metric, a metric expression function, or a scalar value, joined by one or more metric expression operators. See the FAQ which answers questions concerning how to discover metrics and use cases for scalar values. 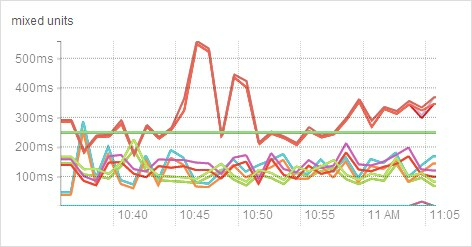 For a list of all the supported metrics, see Cloudera Manager Metrics. Metric expressions support the binary operators: +, -, *, /. Metric expressions support the functions listed in the following table. A function can return a time series or a scalar computed from a time series. Functions that return scalars must be used for heatmap charts. avg(metric expression) N Computes a simple average for a time series. count_service_roles(roleType, roleState) - Returns the number of roles of the specified roleType and roleState. For example, count_service_roles(datanode, running) returns the number of running DataNodes. count_service_roles(roleType) - Returns the number of roles with the specified roleType. count_service_roles() - Return the number of roles. For example, select events_critical where count_service_roles() > 100 returns the event_critical metric when the number of roles is greater than 100.
dt(metric expression) N Derivative with negative values. The change of the underlying metric expression per second. For example: dt(jvm_gc_count). dt0(metric expression) N Derivative where negative values are skipped (useful for dealing with counter resets). The change of the underlying metric expression per second. For example: dt0(jvm_gc_time_ms) / 10.
getClusterFact(string factName, double defaultValue) Y Retrieves a fact about a cluster. Currently supports one fact: numCores. If the number of cores cannot be determined, defaultValue is returned. getHostFact(string factName, double defaultValue) Y Retrieves a fact about a host. Currently supports one fact: numCores. If the number of cores cannot be determined, defaultValue is returned. For example, select dt(total_cpu_user) / getHostFact(numCores, 2) where category=HOST divides the results of dt(total_cpu_user) by the current number of cores for each host. The following query computes the percentage of total user and system CPU usage each role is using on the host. It first computes the CPU seconds per second for the number of cores used by taking the derivative of the total user and system CPU times. It normalizes the result to the number of cores on the host by using the getHostFact function and multiplies the result by 100 to get the percentage. greatest(metric expression, scalar metric expression) N Compares two metric expressions, one of which one is a scalar metric expression. Returns a time series where each point is the result of evaluating max(point, scalar metric expression). integral(metric expression) N Computes the integral value for a stream and returns a time-series stream within which each data point is the integral value of the corresponding data point from the original stream. For example, select integral(maps_failed_rate) will return the count of the failed number of maps. This function is only implemented for single time-series streams. For streams of cross-entity aggregates, continue to use the integral() function. If you apply this method for time-series streams which was created using a version of Cloudera Manager older than 5.7, Cloudera Manager fills in the older data points using the integral() function. last(metric expression) Y Returns the last point of a time series. For example, to use the last point of the cpu_percent metric time series, use the expression select last(cpu_percent). least(metric expression, scalar metric expression) N Compares two metric expressions, of which one is a scalar metric expression. Returns a time series where each point is the result of evaluating min(point, scalar metric expression). max(metric expression) Y Computes the maximum value of the time series. For example, select max(cpu_percent). min(metric expression) Y Computes the minimum value of the time series. stats(metric expression, stats name) N Some time-series streams have additional statistics for each data point. These include rollup time-series streams, cross-entity aggregates, and rate metrics. The following statistics are available for rollup and cross-entity aggregates: max, min, avg, std_dev, and sample. For rate metrics, the underlying counter value is available using the "counter" statistics. For example, stats(fd_open_across_datanodes, max) or stats(swap_out_rate, counter). sum(metric expression) Y Computes the sum value of the time-series. time_series_attribute is one of the supported attributes. For attributes values that contain spaces or values of attributes of the form xxxName such as displayName, use quoted strings. The value for the rlike operator must be specified in quotes. For example: hostname rlike "host[0-3]+.*". value can be any regular expression as specified in regular expression constructs in the Java Pattern class documentation. scalar_producing_function is any function that takes a time series and produces a scalar. For example, min or max. metric_expression is a valid metric expression. For example, total_cpu_user + total_cpu_system. comparator is a comparison operator: <, <=, =, !=, >=, >. Time - ms (milliseconds), s (seconds), m (minutes), h (hours), and d (days). Bytes per second - Bytes and Time: bps, kbps, kibps, mbps, mibps, and so on. For example, 5 kilobytes per second is 5 kbps. Bytes time - Bytes and Time combined: bms, bs, bm, bh, bd, kms, ks, and so on. For example, 5 kilobytes seconds is 5 ks or 5 kis. You use the AND and OR operators to compose compound predicates. Retrieve all time series for all metrics for DataNodes or TaskTrackers. Retrieve all time series for all metrics for DataNodes or TaskTrackers that are running on host named "myhost". Retrieve the total_cpu_user metric time series for all hosts with names that match the regular expression "host[0-3]+. *"
select total_cpu_user where category=role and hostname rlike "host[0-3]+. *"
You can add an expression to the predicate of a tsquery statement that limits the stream to specified days of the week or to a range of hours in each day. By Day – Limits the stream to selected days of the week. By Hour – Limits the stream to a range of hours each day. Attribute names and most attribute values are case insensitive. displayName and serviceType are two attributes whose values are case sensitive. agentName A Flume agent name. applicationName One of the Cloudera Manager monitoring daemon names. cacheId The HDFS cache directive ID. category The category of the entities returned by the query: CLUSTER, DIRECTORY, DISK, FILESYSTEM, FLUME_SOURCE, FLUME_CHANNEL, FLUME_SINK, HOST, HTABLE, IMPALA_QUERY_STREAM, NETWORK_INTERFACE, ROLE, SERVICE, USER, YARN_APPLICATION_STREAM, YARN_QUEUE. select jvm_committed_heap_mb where category=ROLE and hostname="host1"
clusterDisplayName The user-defined display name of a cluster. clusterName The cluster ID. To specify the cluster by its display name, use the clusterDisplayName attribute. componentName A Flume component name. For example, channel1, sink1. device A disk device name. For example, sda. displayName The display name of an entity. Note: The displayName attribute was removed in Cloudera Manager 5. Older queries should be modified to use the cluster or service display name attributes, clusterDisplayName and serviceDisplayName. entityName A display name plus unique identifier. For example: HDFS-1-DATANODE-692d141f436ce70aac080aedbe83f887. expired A Boolean that indicates whether an HDFS cache directive expired. groupName A user group name. hbaseNamespace The name of the HBase namespace. hostId The canonical identifier for a host in Cloudera Manager. It is unique and immutable. For example: 3d645222-2f7e-4895-ae51-cd43b91f1e7a. hregionName The HBase region name. For example, 4cd887662e5c2f3cd5dd227bb03dd760. hregionStartTimeMs Milliseconds from UNIX epoch since Cloudera Manager monitoring started collecting metrics for the HBase region. htableName The name of an HBase table. iface A network interface name. For example, eth0. logicalPartition A Boolean indicating whether or not the disk is a logical partition. Applies to disk entity types. mountpoint A mount point name. For example, /var, /mnt/homes. nameserviceName The name of the HDFS nameservice. partition A partition name. Applies to partition entity types. path A filesystem path associated with the time-series entity. poolName A pool name. For example, hdfs cache pool, yarn pools. queueName The name of a YARN queue. rackId A Rack ID. For example, /default. roleConfigGroup The role group that a role belongs to. roleName The role ID. For example, HBASE-1-REGIONSERVER-0b0ad09537621923e2b460e5495569e7. roleType The role type: ACTIVITYMONITOR, AGENT, ALERTPUBLISHER, BEESWAX_SERVER, CATALOGSERVER, DATANODE, EVENTSERVER, FAILOVERCONTROLLER, HBASE_INDEXER, HBASERESTSERVER, HBASETHRIFTSERVER, HIVEMETASTORE, HIVESERVER2, HOSTMONITOR, HTTPFS, HUESERVER, IMPALAD, JOBHISTORY,JOBTRACKER, JOURNALNODE, KT_RENEWER, LLAMA, MASTER, NAVIGATOR, REGIONSERVER, SERVICEMONITOR, NAMENODE, NODEMANAGER, REPORTSMANAGER, SECONDARYNAMENODE, SERVER, SOLR_SERVER, SQOOP_SERVER, STATESTORE, TASKTRACKER. rollup The time-series store table rollup type. schedulerType The scheduler type associated with the pool service. serviceDisplayName The user-defined display name of a service entity. serviceName The service ID. To specify a service by its display name use the serviceDisplayName attribute. serviceType The service type: ACCUMULO,FLUME, HDFS, HBASE, HIVE, HUE, IMPALA, KS_INDEXER, MAPREDUCE, MGMT, OOZIE,SOLR, SPARK,SQOOP,YARN, ZOOKEEPER. solrCollectionName The Solr collection name. For example, my_collection. solrReplicaName The Solr replica name. For example, my_collection_shard1_replica1. solrShardName The Solr shard name. For example, shard1. systemTable A boolean indicating whether the HBase table is a system table or not. tableName The name of a table. version The version of the cluster. The value can be any of the supported CDH major versions: 4 for CDH 4 and 5 for CDH 5. The following table shows the entities and associated attributes that can appear in the predicate ("where" clause) of a tsquery statement. How do I compare information across hosts? Click Hosts in the top navigation bar and click a host link. In the Charts pane, choose a chart, for example Host CPU Usage and select and then Open in Chart Builder. In the text box, remove the where entityName=$HOSTID clause and click Build Chart. In the Facets list, click hostname to compare the values across hosts. How do I compare all disk IO for all the DataNodes that belong to a specific HDFS service? replacing hdfs1 with your HDFS service name. Then facet by metricDisplayName and compare all DataNode byte_reads and byte_writes metrics at once. See Grouping (Faceting) Time Series for more details about faceting. When would I use a derivative function? Some metrics represent a counter, for example, bytes_read. For such metrics it is sometimes useful to see the rate of change instead of the absolute counter value. Use dt or dt0 derivative functions. When should I use the dt0 function? Some metrics, like bytes_read represent a counter that always grows. For such metrics a negative rate means that the counter has been reset (for example, process restarted, host restarted, and so on). Use dt0 for these metrics. How do I display a threshold on a chart? See Grouping (Faceting) Time Series for more details about faceting. I get the warning "The query hit the maximum results limit". How do I work around the limit? There is a limit on the number of results that can be returned by a query. When a query results in more time-series streams than the limit a warning for "partial results" is issued. To circumvent the problem, reduce the number of metrics you are trying to retrieve or see Configuring Time-Series Query Results. 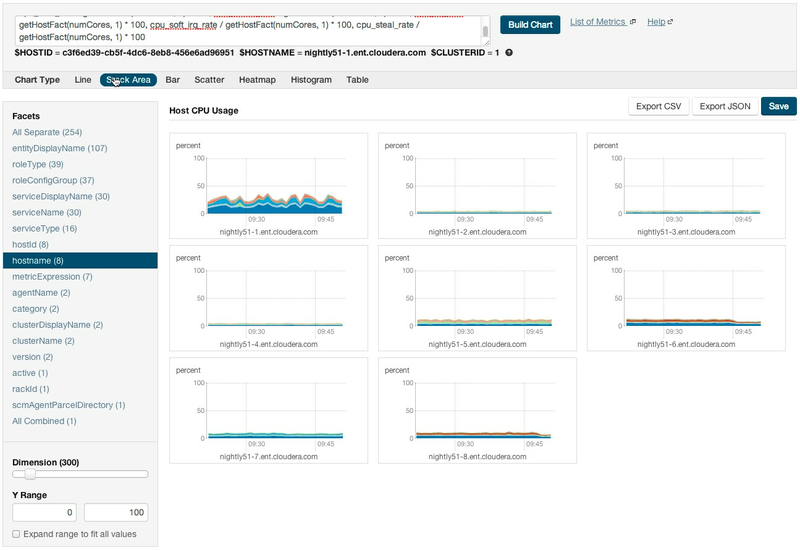 select await_time, await_read_time, await_write_time, 250 where category=DISK and hostname rlike "host1[0-9]?.cloudera.com"
The latter query retrieves the disk metrics for ten hosts. How do I discover which metrics are available for which entities? Type Select in the text box and then press Space or continue typing. Metrics matching the letters you type display in a drop-down list.